On Saturday, April 13, Erin R. Corrales-Diaz, Ph.D. assistant curator of American art at the Worcester Art Museum presented: A Great National Painting: James Walker’s The Battle of Gettysburg. 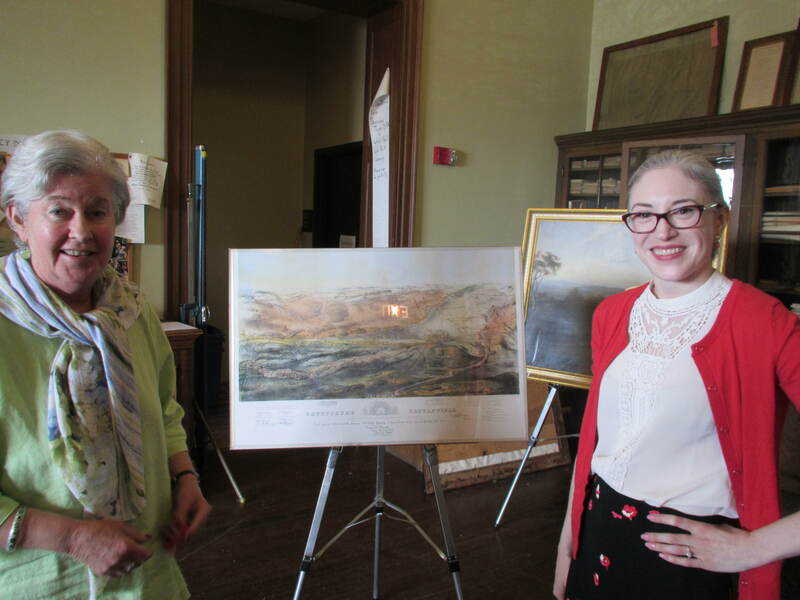 Barbara Wicker and Erin Corrales-Diaz with the isometric map of the Battle of Gettysburg in the Society’s collection. Six years in the making, James Walker’s twenty-foot long The Battle of Gettysburg debuted in Boston on March 14, 1870, but currently resides in Spartanburg, South Carolina. Commissioned by John Badger Bachelder, The Battle of Gettysburg captivated American audiences with its attention to detail and perceived veracity. Erin detailed the biography of the painting from its inception to its current location and all permutations in between. Bachelder was a Hyde Park resident from 1880, until his death in 1894. Erin described Bachelder as the P. T. Barnum of the American Civil War – with his great showmanship and commercialization of the painting. The presentation lasted a little over an hour and was delivered with a wonderful slide show and passion for the subject matter. In honor of Erin Corrales-Diaz’s presentation, the Gettysburg Cannon was on display for our members to view. The cannon was awarded to Hyde Park’s John Badger Bachelder for his work as the official historian of the Battle of Gettysburg – Read more. The newly restored painting – A View of Camp Meigs from Fairmount Hill by Thomas Badger, 1863, was also displayed and the Society hopes to sell prints of this painting at a later date. Please contact the Society to register interest at info@hydeparkhistoricalsociety.org.